Adapted from the Reginald Rose teleplay by Sherman Sergel and directed by Vanessa Jensen, the play is set in a jury deliberation room on a sweltering hot New York evening in 1957 where 12 unnamed men must decide the fate of a young man accused of murder. As the biases, personalities and tempers of the jury come together, each questions how he should vote, intensifying the uncomfortable nature of the room. 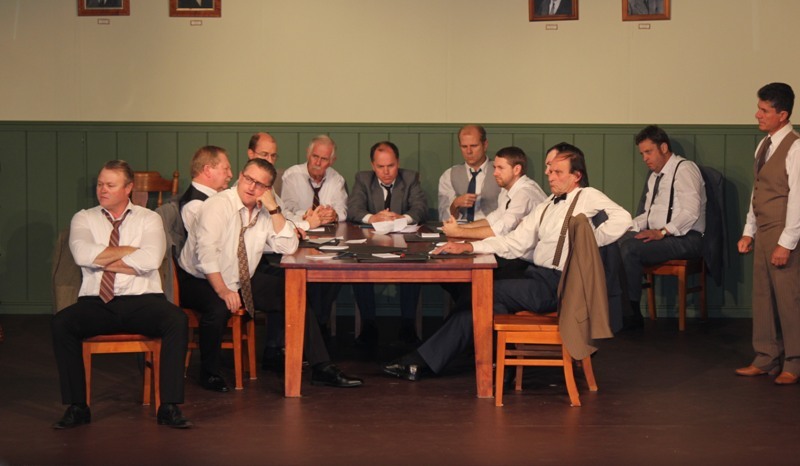 First created for television in 1954, Twelve Angry Men became a stage play the following year and then a feature film with Henry Fonda in 1957, scoring three Academy Award nominations. 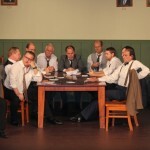 ‘Twelve Angry Men’ was adapted for the stage by Sherman Sergel from Reginald Rose’s gripping novel. The book being written at the age of only 34 years old, just after having served on a similar jury. Born in Manhattan in 1920, this controversial writer died in 2002. This tense, fast moving play can be seen nightly at 8.00 pm in the Melville Theatre, on the corner of Stock Road and Canning Highway, Palmyra. Performances until Saturday the 17th May. There is one matinee on Sunday 11th May at 2.00 pm. The set quality was extraordinary; it had wooden panels painted in the old arsenic green of the day, with light green walls above. A small window was on one wall and a door on the opposite wall. There were framed photos of the past half dozen presidents displayed (set built by the Jensen Clan and the cast). In the centre of the stage was a large wooden table with 10 matching wooden chairs around it. The Jury Room is empty, but we hear the voice of the Judge (Eddie Stowers) from the Courtroom advising the jury that a majority verdict would not be acceptable, only a unanimous one. He also states that should there be any doubt; the boy must be found innocent. The door opens and the guard (Garry Davies) enters to lay out the paper and pens for the jury. A minute later he leads the all-men jury into the room before locking them in. 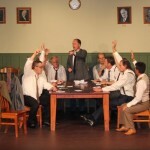 The Foreman of the jury (Cary Hudson) asks everyone to take a seat. The men briefly discuss the case of murder against the 16-year old defendant, and whether he should be condemned to death. The Forman calls for an initial vote, and only one, quiet, smartly dressed man (Gino Cataldo) is definitely not convinced of the youth’s guilt. One big built man (Phil Barnett) is horrified at how the standards of teenagers have slipped and is determined to bully his opinion through. He is strongly supported by a loudmouthed bigot (Phil Lord), whose attitude aggravates the juryman with a strong foreign accent (Willy Smeets). A bespectacled, OCD, nervous man (Warren McGrath) is most uncomfortable with the whole atmosphere and finds a friend in the quiet, elderly juryman (Tom Rees) next to him. With several strong personalities, whose influence will shine through? Will the winner be logic and decency? Or plain brute force? 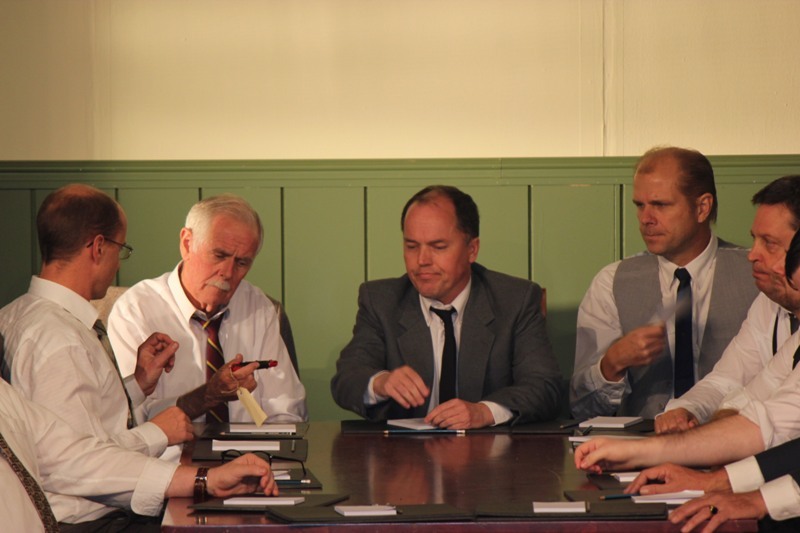 The other jurors were played by Alan Kennedy, Brendan Ellis, Will Gawned, Michael Dornan and Jeff Hansen. Finding thirteen male actors must have been a difficult enough task, but to have them all capture the same American accent (advisor Cicely Binford) and be capable of displaying anger so well, must have brought sleepless nights. Each member of the jury had very specific and individual characteristics, coupled with a full range of temperaments. It would have just taken one wooden or faltering performance to ruin the remarkable atmosphere and tension, but the cast were dazzling, not a flicker in the powerful presentation. 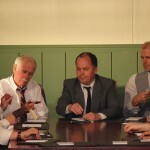 Director, Vanessa Jensen, then had the problem of having a table with twelve men around it and still making it possible for each person to be seen by the whole audience. The cinema has the luxury of close-ups from any angle around the jury room; the theatre audience however is fixed. The director cleverly kept the men moving around the table, wandering to the window and drinking at the water cooler. She unobtrusively brought the jurymen who were speaking to the front of the stage. The dynamics of the whole production was slick and absolutely amazing. Lars Jensen did a wonderful job of creating an old fashioned, dim lighting in the room. The mood was heightened by a strong beam of sunset light, shining through the window and onto the rear wall … and then, due to the famous local power instability, there was a blackout. Congratulations to the operator who hit the rest button in a micro second, and the actors moved on faultlessly. Melville has an excellent reputation, but this play must be one of their best in years. Even with what is a fairly serious, dry topic, the house was full on the first night and had only a few spaces the next night, so book before you go, and go you must!